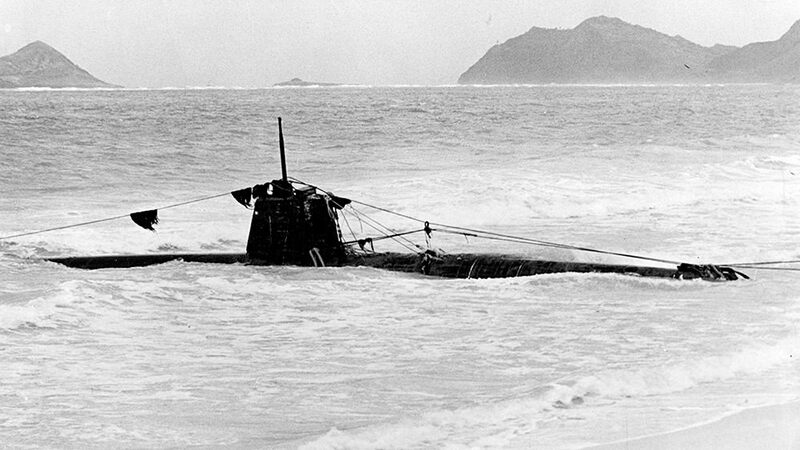 The Japanese mini submarine HA-19 (similar to the mini sub sunk by the USS Ward), which washed ashore on December 8, 1941. Photo courtesy of Naval History and Heritage Command. On December 7, 2016, 75 years after the attack on Pearl Harbor, join NOAA for a live dive on two Japanese mini submarines, the first of which was sunk by the USS Ward prior to the attack. This will be the first time the public will be able to view live underwater exploration of the submarines in real time. media/exstream/exstream.html on the morning of December 7. Live streaming will start at 6:30 a.m. HST (8:30 a.m. PST, 11:30 a.m. EST.) A team of maritime archaeologists and scientists from NOAA’s Office of National Marine Sanctuaries and Office of Ocean Exploration and Research will live-stream the dive. A remotely operated vehicle deployed off of the NOAA Ship Okeanos Explorer will send back images of the wreck site.